We had a visitor come to the Treasure Tour a couple weeks ago who was asking after one of the pieces in the collection called a "Deagan Una-Fon." It is an odd-looking contraption with a piano keyboard but no strings, a paper roll, and a series of bells of different sizes. 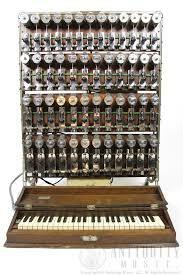 It was developed by a musical innovator named John Calhoun Deagan. Deagan is largely forgotten today, but he definitely made an impact on the world of music. In 1880, he scientifically tuned a glockenspiel (metal bars, metal mallets, lots of percussive melody). He also made the xylophone and the marimba staples in American musical culture. But the accomplishment for which he should be best remembered is one that only professional musicians can truly appreciate. Up through the early twentieth century, orchestras and bands had their own techniques for determining their sound. That means that they might have sounded dramatically different from one city to the next - indeed, from one conductor to the next. It created inconsistencies that might have proven confusing for the players in the band. That all changed when Deagan convinced the American Federation of Musicians to adopt A=440 as the universal pitch for ensemble pieces. It's something taken for granted today, but back in 1910 when he initiated the change, Deagan's impact was huge. By contrast, his Una-Fon is little appreciated today. Maybe the American Treasure Tour, with your help, can do something about that.